Few rappers have had a tougher run to recognition than MF Doom. Kickin raps since he was a kid growin up on Long Island, Doom started out as Zev Love X, and along with his younger brother DJ Subroc and another cat named Onyx the Birthstone Kid formed the up and coming group KMD. This was back in '88 when Doom was 17, they were kickin afrocentric rhymes, and gettin their videos played on RapCity. But just as they were getting ready to take off tragedy struck. Subroc was killed runnin across the Long Island Expressway in '93 right before the release of their second album, that same week Elektra Records dropped them from the label, and the album got shelved. Zev dropped off the scene and into depression, and in his own words "swearing revenge against the industry that so badly deformed him." And thus MF Doom was born. Returning to the scene in '97 he began to bolster his burgeoning underground rep that survived from the KMD days. The Doom persona, based off the Fantastic 4 supervillain Doctor Doom, is just one of the aliases that the man himself raps under, but regardless of his name he is never publicly seen without his trademark mask. And his style changed. His flow has always been smooth, but upon his return his voice is grittier and his subject matter, while intellectual is often dark. But theres somethin about the flow that I love, its got resolve and determination, a stoicism to be respected. Since the comeback Doom has become a bit of a polarizing figure in the rap community, most like him but many still dogg his style. Hes put out a ton of work including dope collaborations with Ghostface, Madlib, and Danger Mouse. Like him or not you gotta respect the man. Ive put up two of the classics. 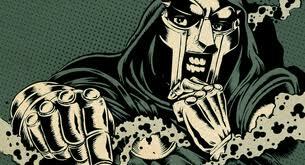 The first is Doomsday off his return release Operation Doomsday. Doom goes for the marathon flow, never slowin and steady rhymin through the whole song. He mixes the hook in so seamlessly that you barely even notice it. And the beat is so smooth that I feel like I could listen to the instrumental on repeat as the soundtrack to my life. Like a lot of fine art the second track is beautiful but sad. Let Me Watch is a tale of love found and lost. Featurin Apani B Fly, one of the most underrated female rappers ever, the two trade verses that remind us all of a reality weve known on some level. Check em.